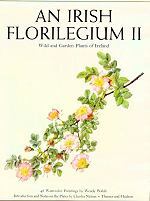 The first volume of "An Irish Florilegium", also containing 48 watercolour paintings by Wendy Walsh and notes by Charles Nelson, was published in 1983, and is now out of print. The second volume, published last year, will be welcomed by botanists, horticulturists and bibliophiles. In May 1955, we had an exhibition of flower paintings at the Auckland War Memorial Museum as part of the Auckland Festival. It was entitled "Flowers of Five Centuries", and included many watercolours, drawings and coloured plates borrowed by Dr William T. Stearn on our behalf from the British Museum (Natural History), Royal Horticultural Society, and private collections. The flower paintings of Wendy Walsh are equal to the best of those displayed in 1955; they have a delicacy, naturalness and charm that I think is well described as "exquisite". Wendy Walsh also provided the colour plates and drawings for "An Irish Flower Garden" by E. Charles Nelson (1984), and is working at present on illustrations of the unique flora of the Burren, an area of limestone terraces in County Clare. Charles Nelson was born in Northern Ireland, graduated in botany from the University College of Wales, Aberystwyth, and completed a Ph.D. degree at the Australian National University, Canberra. He is taxonomist at the National Botanic Gardens, Glasnevin, Dublin, and visited New Zealand in April and May of 1988 on his way to the Botanical History Symposium on the development of Systematic Botany in Australasia, held at the University of Melbourne, 25-27 May 1988. Dr Nelson lectured on Ireland's gardens and New Zealand plants, on early introductions of Australian and New Zealand plants to Europe, and on the botanical and horticultural consequences of 19th century exploration in Australasia, to the Department of Botany, University of Auckland (2 May), to the Auckland Branch, RNZIH (3 May), to the Wellington Branch, RNZIH (9 May) and to the Annual Conference, RNZIH, Christchurch, (13 May). Among Dr Nelson's many published papers, several proved invaluable when we were writing "Economic Native Plants of New Zealand" (by S. G. Brooker, R. C. Cambie and R. C. Cooper, published by Botany Division, DSIR, Christchurch, February 1988). For example, his paper on "Australian plants cultivated in England before 1788" (Telopea 2 (4):347-353, 1983) was the basis for our account of the New Zealand plants grown in Europe from seed taken back to England on Cook's three voyages. His magnificent book on the National Botanic Gardens, Glasnevin, (with E. M. McCracken, published by Boethius Press, Kilkenny, 1987), mentioned a number of later introductions from New Zealand. In "Florilegium I", Wendy Walsh provided a painting of Pittosporum tenuifolium 'Silver Queen', raised about 1900 from a bud sport at the Slieve Donard Nursery outside Newcastle, County Down. I came across the cultivar in catalogues when I was revising the Australian and New Zealand species of Pittosporum (Annals Mo. Bot. Gard. 43: 87-188, 1956), but was unsuccessful in finding out much about it and missed the Award of Merit given by the RHS in 1914. We are fortunate now to have lists of cultivars in "The Cultivation of New Zealand Trees and Shrubs" by Lawrie Metcalf (Reed Methuen, Auckland, 1987). In volume II of "An Irish Florilegium", Dr Nelson explains why the 48 plants were chosen  ie. as some of the truly native species of Ireland, or as some of the exotic species that were discovered or introduced into cultivation by Irish botanists and gardeners, or as some of the superb cultivars associated with Irish nurserymen and gardeners. Olearia 'Henry Travers' honours an Irish-born plant explorer; Hebe 'Headfortii' is one of a number of fine cultivars raised in Irish gardens. An Olearia was sent from Wellington to the Botanic Gardens, Glasnevin, by Henry Travers in 1908, and flowered in 1910 as Olearia semidentata Decaisne. However, it differs from the type, and Dr Nelson has named it 'Henry Travers', discussed its possible parentage, and given an outline of the work of W. T. L. Travers (father) and H. Travers (son) in New Zealand botany. Wendy Walsh's illustration (Plate 22) shows a superb tree daisy with pale-lilac ray florets and rich-purple disc florets. Hebe 'Headfortii' (Plate 35) was raised by the Marquis of Headfort in his garden at Kells, County Meath, and distributed about 1930. The sender of the seed from New Zealand is not known, and the parentage of the cultivar is also mysterious. If any reader knows who sent seed to Kells in the 1920s, please advise Dr E. C. Nelson, National Botanic Gardens, Glasnevin, Dublin 9. The price of eighty pounds sterling is an obstacle in these days of reduced library budgets, but "An Irish Florilegium II" is a lovely book with fine illustrations and accurate readable text, and is well worth the money.